RVTR, a design research practice with studios based in Toronto and Ann Arbor, have undertaken a multi-faceted investigation into possible urban futures for the Great Lakes Megaregion of North America. The study is based in the proposition that by investigating interdependent agents, material flows and policies, and by focusing on “back of house” activities of cities and their support systems—such as infrastructures, logistics and ecologies— , architects can conceive new distributed urban architectures that have the potential to actively transform the future of cities, settlement patterns and metropolitan life. Utilizing tools of urban analysis and formal intervention, RVTR aim to re-conceptualize future boundaries, governance, politics, economies and public architecture. 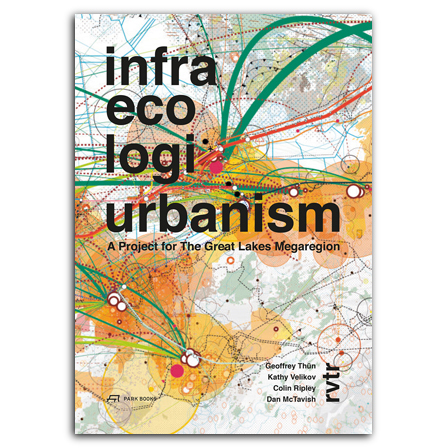 Infra Eco Logi Urbanism presents comprehensively RVTR’s findings and proposals. Around 100 images, visualizations and graphics illustrate the text. The book also features essays situating the historical development of the region around transportation, and investigating possible future worlds and utopias within the context of the specific project and more broadly the practice of design-research.